At first I wondered what a cardinal was doing, hover-flying near a flowering bush, almost like a hummingbird. The next time I took a walk, I saw him sitting on the grass. He let me take a photo, and then flew up in short stretches to a wire, another wire, a tree branch, another tree branch, and finally, all the way across the street. That is when I figured out that he was learning to use his wings. The next day, in a misty rain, there he was again, perched on a white picket fence, before he flew up to a wire. You go, cardinal! I hope you make it all the way. The cardinal has been the species that has most taught me connection to the earth. It began unexpectedly in the winter of 1985, when I was going through a difficult transition. My marriage had ended at the close of 1984, and I was deep in grief about that loss. One winter afternoon, sunk in sadness, I heard a curious sound outside my window. 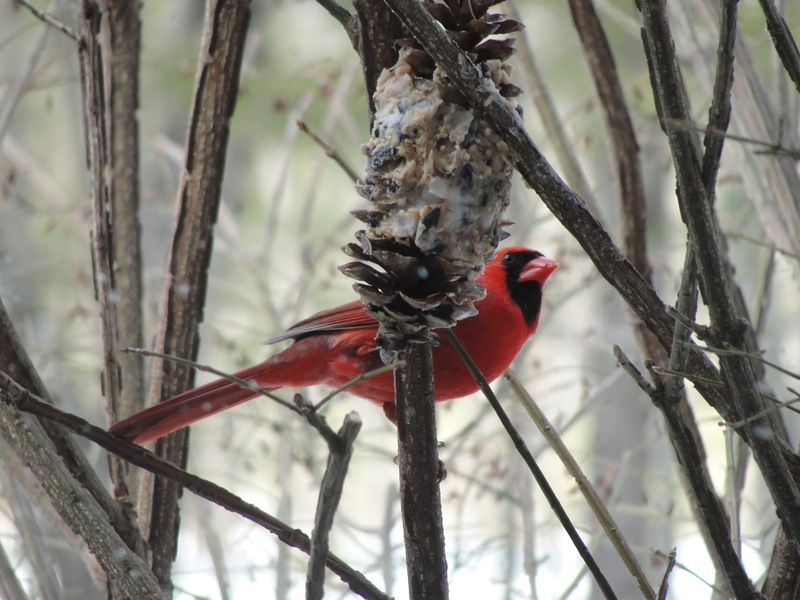 When I looked out to investigate, I saw the bright red plumage of a male cardinal. Its song was distinctive and joyful, and its color shown brilliant against the gray Chicago snow. My heart was lifted by its melody. Ever since that moment, the cardinal has signaled for me beauty and hope in the midst of suffering. So you can imagine my chagrin when, early in the summer of 2011, my partner Margy found a dead cardinal beneath one of the windows of our house. We always feel sad when a bird flies into a window—but this was a young female cardinal, and Margy knew I’d be very downhearted about it. I wondered what sort of message it was bringing, or even what bad omen it might portend. I know that sounds superstitious, but after we have associated one of our fellow creatures with a sense of blessing, it is unnerving when something like this happens. A friend reminded me that death is a part of life. She said, pay attention for the blessing here. So I blessed the cardinal’s small body with incense, and buried it in the composting leaves at the back of our yard. I thanked the cardinal for the joy her species had brought into my life, and wished her well in the great cycle of life. I decided to put hanging streamers around our windows, to help deter future bird accidents. During this time, I had begun reading Leslie Marmon Silko’s book, The Turquoise Ledge. It was a memoir of her days walking the arroyos near her home in Arizona. I found it a strangely quiet book. She writes about going for walks, and the creatures around her house. She talks about making peace with the creatures who live in the same place she lives—in her case, that included rattlesnakes and grasshoppers. Sometimes creatures died near her house, too, and she felt sad about it, like I felt about the cardinal. In our yard, we have chipmunks and birds and squirrels and toads. Sometimes deer or turkeys wander through, and neighbor cats. One has to slow down and be quiet to notice the creatures of the earth. It seemed to me that the dead cardinal might be saying: Stop! Stop pushing, stop trying, stop doing, let go. Be still. Be outside. Listen. Everything is a blessing. Everyday you can go out among the trees right here. Stopping is a way to pray.